When should I rehair my bow? If you play a lot, you may want to rehair your bow twice per year. For middle and high school students, once per year is usually sufficient. We recommend using only horse hair, as synthetic "hair" does not hold resin well and does not produce a good tone. 1. 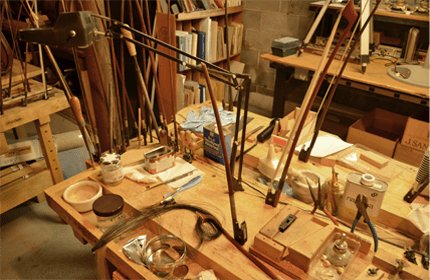 After use, it is important to loosen the hair on the bow before putting the instrument away. Leaving the tension on the bow could damage the bow itself. 2. Never touch the hair of the bow with the palm of your hand because the oil from your hand damages the hairs. It is always best to wipe the instrument clean with a dry cloth. 3. In humid areas like Atlanta, it is best to use a hard resin to prevent excessive caking.